Introduced in 2007, the EU Directive 2003/58/EC concerns emails sent by companies as part of their business operations. Previous regulations applying to written correspondence by letter or fax were extended to emails and other forms of electronic communication. 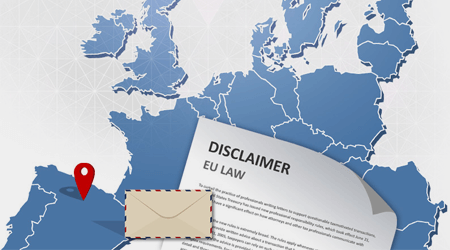 All business emails must include an authorized EU email disclaimer with the company’s registration number, the place of registration and the registered office address. Each member of the EU had to enforce this law before 31 December 2006. To this end, several key members adopted this EU email disclaimer law in a number of ways. The Companies Act 1985 was already in place when the Directive was introduced, applies to private and public limited companies or a Limited Liability Partnership. The company’s registered name (e.g. ABC Ltd). Registration number (listed on Companies House). Place of registration (e.g. England). This is enforced by Trading Standards with fines for non-compliance starting at £1,000 with an additional fine of £300 per day if the breach continues. 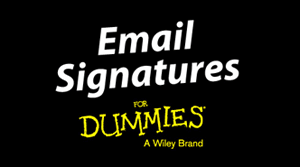 If the disclosure of email content leads to a dispute, it can be argued in court that the recipient should have known to not disclose the information. Whether the company is a limited company. If it is exempt from the obligation to include Limited in its name. If it is being wound up, in liquidation etc. Any reference to share capital must be paid-up share capital. Failure to display this information in an email disclaimer constitutes a criminal offense that is subject to a maximum fine of €2,000. The name of the managing director and the board of directors. Failure to comply comes with a maximum fine of €5,000. On another note, privacy statements intended to act unilaterally, confidentiality disclaimers, and liability disclaimers have no legal standing under German law. If they are in the process of insolvency proceedings. Address of its registered office. Registration number of relevant country. If it is subject to insolvency proceedings where appropriate. If it is run by a lease manager or an authorized management agent. Any infringement of these points is subject to a fine of €750 per infringement. If applicable, whether the company is going into liquidation or being wound up. There is a Dutch law that requires every company to display their CoC number on all outgoing written communications including email. Failure to follow this law can result in a fine of up to €16,750 or up to six months imprisonment as it constitutes an economic crime. From 4 May 2006, all Danish companies were required to include their name, location and Central Business Register (CVR) number to an email disclaimer. With all the regulations and stiff penalties that can be applied to a company, it is better to prepare for all eventualities than to do nothing. The EU Directive 2003/58/EC forces companies to be more transparent so it is best practice to create an EU email disclaimer that is specific to your organization and the country you are based in, which is then strictly enforced as company policy. This means that you are less likely to run into any legal complications in the future. The General Data Protection Regulation (GDPR) came into place 25 May 2018, superseding the EU Data Protection Directive 95/46/EU. GDPR is an EU law on data protection and privacy for individuals in the European Union and the European Economic Area. The key objectives of GDPR is to give individuals control over their personal data, as well as ensuring companies based both inside and outside the EEA are correctly handling the data of individuals living in the EU. Failure for companies to comply with GDPR can result in a fine of 4% of a company's annual turnover or €20 million, whichever is greatest. 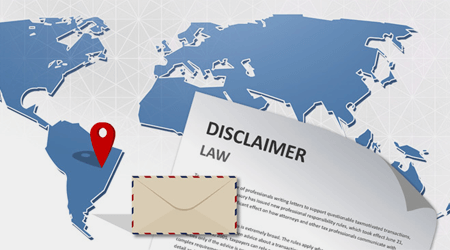 Although having an email disclaimer is not a requirement of GDPR, there are ways to help companies comply with the regulation by using a disclaimer. For example, an important part of GDPR is email consent. Companies should not email someone who has not actively consented, and also should provide a clear way for someone to unsubscribe if they have consented. Including an unsubscribe link will easily allow the email recipient to opt-out of any communication from your company. The need for a comprehensive email archiving solution is clear. IT administrators must implement appropriate technical and organizational measures to protect personal data against accidental or unlawful destruction or accidental loss, alteration, unauthorized disclosure or access. These elements cannot be provided by generic mail servers as already indicated by compliance with the UK Data Protection Act. The Markets in Financial Instruments Directive 2004/39/EC came into effect on 1 November 2007, when it replaced the Investment Services Directive (ISD), which directly affects EU financial markets. MiFID extended the coverage of ISD and introduced new and more extensive requirements that firms have to adapt to, in particular for their conduct of business and internal organization. The European Commission (EC) revised the Directive, known as MiFID II, which was adopted by the European Parliament on 15 April 2014. EU Member States are required to implement the MiFID II Directive by June 2016 and the package of measures by January 2017. This is designed to make financial markets more efficient and improve investor protection, which is particularly relevant in the aftermath of the 2008 recession.